At noon on August 15th, 1945, the Japanese people, for the first time, heard the unexpectedly high-pitched voice of the Showa Emperor (Hirohito) crackling over the radio. The God-Emperor (as he was considered at that time) announced in an archaic form of speech which few could actually understand (and which amused quite a few children back then), that the unimaginable had to be accepted, and that the struggle against the enemy (the United States and its allies) had to be abandoned with surrender. This marked the end of a long period of Empire, expansionism, militarism, and extreme nationalism which in a way can be said to have been initiated as an over-enthusiastic imitation of the great Western colonial powers which had forced Japan to open up to the world almost 100 years earlier, and which because of poor judgment and over-optimism ended in the total devastation of the country and millions dead (not to mention the suffering and humiliation brought to other Asian and Pacific peoples). As the meaning of the Emperor’s message was slowly comprehended, millions were dumbstruck or overcome by a cathartic weeping. This day in mid-August has come to be accepted as the day of remembrance for those who perished in that war, which actually began with Japan’s incursion into Manchuria in 1931 and its brutal ten-year struggle to gain the upper-hand in China before fatefully deciding to attack the United States. August 15 has also become a day of controversy, especially because of visits to Tokyo’s Yasukuni Shrine (靖国神社, Yasukuni Jinja). You might ask what the problem would be for people to visit such a shrine, as most countries have similar ceremonies commemorating their war dead. Well, the problem (especially for Japan’s Asian neighbors) is that among the millions enshrined are numerous convicted war criminals. Thus visits to the shrine by Japanese politicians arouse great anger in China and Korea (and among many Japanese). This foreign criticism then arouses the anger of Japan’s Right-Wingers (u-yoku, 右翼), who feel that Japan has bowed to hypocritical foreign pressure and has had to conceal its true self. This cycle of accusations has made Yasukuni Shrine the center point of the struggle over how the history of WWII should be perceived. It has subsequently become a symbol and rallying point for Japan’s numerous and very vocal right-wing groups. These days there is little talk of The War in Japan, and in fact most foreign residents are surprised and disappointed to find that there is almost no political discussion of ANY SORT in this country. Topics which lead to an expression of one’s true feelings or opinions (except for which foods you like or dislike) or any controversial subjects are usually avoided. For that reason many foreigners living in Japan LONG FOR the excitement of a good debate, and of hearing some heartfelt political opinions, even those that might be SERIOUSLY DISAGREED WITH. Spending an August 15th at Yasukuni Shrine (as I usually do) provides a sufficient dose of opinions and political stimulation to last for a long, long while. Also, for those interested in Ibaraki, there is also strong relevance, as the xenophobic Emperor worship which had Japan in its grip for decades, and now lives on in numerous fringe groups, was originally promoted by the Mito Clan (Mito is now Ibaraki’s capital) whose sponsorship of Mito Studies (Mito-Gaku,水戸学) provided the intellectual framework which eventually led to the Meiji Restoration and a whole slew of extreme slogans (the most famous being SONNO JO-I (尊王攘夷, Revere the Emperor, Expel the Barbarians!)). Let me tell you what my day was like. I took TX to Kita-Senju, changed to the Hibiya Line and then changed again at Kayabacho to the Tozai Line and got out at Kudanshita, which is the nearest station to the shrine. Heading to exit no. 1, I first came face to face with the reality of the day and the occasion. 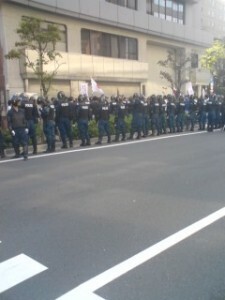 A group of young riot police (kidotai) in full battle-gear. I headed up the escalator and onto street level which was very hot, both temperature-wise and emotionally. The street up Kudanzaka, towards the shrine was crowded and excited. There were many activists who had set up booths on the side walk. They were handing out leaflets and asking for signatures for various petitions. It was like being at the Student Union Building of an American or European university, except for where at those institutions students tend to push liberal or left-wing causes, these activists were all decidedly leaning to the right or far right. Mostly, this was not expressed in a personal way, and I, a foreigner, was given pamphlets (even one demanding that political rights not be granted to foreign residents in Japan! ), asked for my signature (which I politely refused) and was patiently and passionately told about each particular cause (after I showed interest). One Watanabe-san provided me with painstaking details about what he was gathering signatures for. He told me how, at the end of the Battle of Okinawa, hundreds of villagers on a small island had committed suicide. After the war, survivors claimed that they were ordered to do so by the Japanese military commanders on the island, and they demanded compensation. The court ruled in favor of the islanders. Mr. Watanabe, 63 years later, was standing in the hellish heat all day long trying to get signatures to CLEAR THE NAMES OF THE OFFICERS IN CHARGE! Other groups were calling for the independence from China of various regions including Taiwan and Tibet. Of course the police presence was enormous and you could not help but feel sorry for the young guys who were all padded and helmeted in the heat. The road which goes up the slope parallel to the shrine was lined with the loud-speaker trucks (gaisensha) of the various right-wing groups who had gathered for the occasion. As I entered the main worshipper’s path to the shrine I also started to see the Yasukuni COS-PLAY people, those who don Imperial Army costumes and paraphernalia. They sit in the shade on the side of the path, sometimes singing old war songs (gunka) to the accompaniment of a harmonica. Also, uniformed u-yoku sit in groups drinking, singing, posing and posturing, before or after having prayed before the shrine. It is important to remember, however, that among all the tens of thousands who came to the shrine on that day, 99% were typical looking Japanese people, of all ages, who came to quietly, and as quickly as possible, pay their respects to the fallen dead. There are many elderly people who probably lost dear ones in the war. These people even come in groups, by the busload. The extremists and other fringe-elements who end up being featured in the media are a tiny but VERY NOTICEABLE minority. 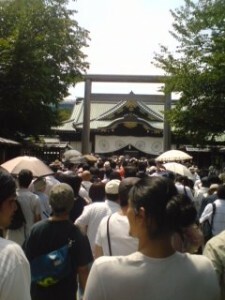 As I passed through the main gate of the shrine, the line to reach the Main Hall began and those who came to worship had to stand in line for a LONG TIME, fully exposed to the sun. Nobody was complaining, but I couldn’t help but wonder why they couldn’t put up some sort of canopy for some shade. Though tourists and journalists like to photograph the costumed, posturing right-wing cranks who line-up in front of the shrine (with the general public), the real powerful and shadowy u-yoku groups, in their very expensive suits and haircuts (or shaved heads) can be seen through the wooden grill to the right of the main hall. Within the confines of the shrine itself they are given food and are taken into the inner sanctuaries for purification and blessing before they join in singing KIMIGAYO, Japan’s national anthem. These characters seemed much more ominous to me than the riff-raff u-yoku hanging out in the front. This inner-hall ceremony is open to anyone, including foreigners, who want to pay the fee. The most celebrated visitor this year was Tokyo’s outspoken governor Shintaro Ishihara who was greeted with cheers and flag waving. I asked bystanders by if Prime Minister Fukuda would be coming to the shrine and they disgustedly told me that he wouldn’t be coming. As usual, I stopped to look at the monuments to the various animals who died in Japan’s various war efforts. The dog, the horse, and the pigeon. There were offerings for the animals — dog food, carrots, water, rice balls — but much fewer than previous years. Also drawing the attention of many Japanese visitors was the monument to Radhabinod Pal, the only dissenting judge at the Tokyo War Crimes Trial. 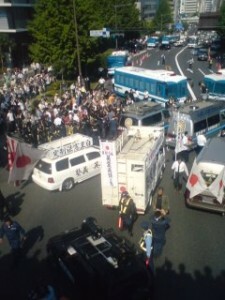 At 2:30, about a kilometer from the shrine’s Main Hall, a demonstration by groups who oppose the Emperor system and militarism was scheduled to be held. The right-wingers who just earlier had been hanging out in the shade, were now ready to rumble. When the police blocked off the road so that their loud-speaker trucks could not pass, pandemonium broke loose. I had imagined that nearby the shrine the u-yoku would not use the blaring speakers and especially not use foul language while so many worshippers were nearby. But logical thinking is a not a strong-point of these guys. All the loudspeakers went at it at once. I HAVE NEVER HEARD SUCH A DIN (it was like 50 rock concerts at once!). Though I have always felt there was some cooperation between the police and u-yoku, I was surprised by the barrage of insults hurled at the police and riot squad, for all of Tokyo to hear. I was even more surprised to hear how many bystanders, mostly suit-wearing salary-men shouted support to the right-wingers. As I walked over toward the demonstration there were many more Caucasian foreigners who had come to gawk and take pictures. The right-wing groups were blocked off by phalanxes of riot police, but that did not stop them from using their loudspeakers. 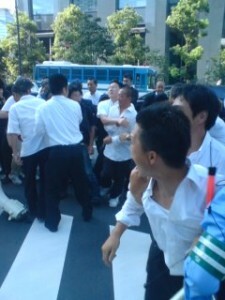 Any overexcited u-yoku who wanted to show his dedication to the Emperor by beating up an anti-war activist was held back or tackled by the police. 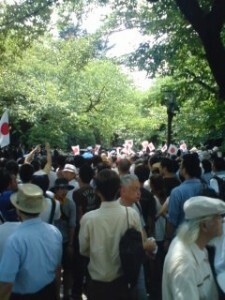 The real trouble happened after the demonstration, as the left-wingers (sa-yoku) started to leave. As they got further away from the allotted demonstration site, there was less protection and some thugs were waiting to beat them up. Interestingly, none of the elderly or female protesters were attacked. The u-yoku would pick out the able-bodied men and proceed to gang up on them. The leftists were no softies, and actually held their ground. The police of course intervened, and finally showed their bias shouting at the protesters to just go the hell home. After spending so many hours in the heat without sitting down, I was physically exhausted and the real battling I had seen had me shaken. On the train back home I certainly had a lot to think about and had some thoughts about what I had experienced. This entry is getting much longer than I planned it to be however, so I will leave them for another time. What do you think? Please let me know. Trouble Explaining Your Condition to Doctors in Japan? As a Judge in the Tokyo War Crimes Trial (the movie version) I know that the winner writes the rules and history. As a coward (in real life) I avoid any situation in which I might take the stray bullet (in the USA) or punch (in Japan) when things get out of control – and Yasukuni seems to be building to that kind of situation. It is certainly becoming a most highly charged place on August 15. I observe that much of Japan’s foreign and domestic policy seems to be formulated in Washington and can appreciate that many Japanese might disapprove of external pressures. 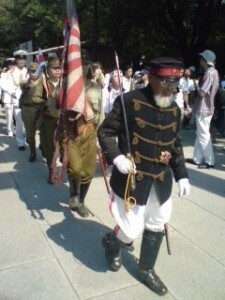 I think that the Class A War Criminals at Yasukuni, regardless of what they did and how bad they might have been, are and will remain dead and thus not likely to trouble anyone again except when August 15 rolls around next year. Thanks for your interesting report! Great article, Avi. I was interested to hear about the animals that are enshrined there. Dan, You always come to mind when I think about the Tokyo Tribunals! The DVD version of PRIDE seemed to be selling well at The Yasukuni Shrine gift shop. I hope you are getting royalties. It would be intertesting if you could write about your experience of being involved in the making of that film.I remember you telling me how Scott Wilson(who played prosecutor Joseph Keenan) was not very much fun to work with. What was director Shunya Itoh like? star Masahiko Tsugawa,must be an old friend of outspoken Right Wing Tokyo Governor Ishihara.His film debut in 1956 was in the classic KURUTTA KAJITSU(CRAZED FRUIT) starring beside Ishihara`s late great brother Yujiro. The then youthful governor makes a cameo appearance, AND he wrote the script. You should watch this film ,which even back then has Ishihara warning about the evils of westernization. After you see it, watch A Place In the Sun, with Elizabeth Taylor. You`ll be in for a surprise. Anyway Tsuguwa and Ishihara go way back. he greatly ENDANGERED the life of the Emperor through his policies. If it were not for MacArthurs obssessive Anti-Communism and desire to use Japan to help stop expansion of the USSR, the Emperor would surely have been tried as well. Also, as a proper Japanese warrior, he should have taken his own life, thus avoiding trial and atoning for his failure. He even failed at that. I think that if the Revisionists want to make a stronger point, instead of making Tojo into a victim ,a film should be made about the Americans who would have been tried as war criminals if Japan had won the war. Leading the list in my opinion is Curtis Lemay, who pushed through the policy of aerial bombing which was devised with THE INTENTION TO KILL AS MANY CIVILIANS AS POSSIBLE. He did a fine job of that. Ironically he was decorated by the Showa Emperor for his services. Im waiting for your ON THE SET notes, Dan. Yes, Shaney, it is interesting and also VERY MOVING for me. Especially how people bring offerings of food and water.I was surprised that none of the major English language guide books to Tokyo mention the animal monuments in their entries on Yasukuni. I think it is worthy of note even amidst all the controversy of the shrine. Have you ever noticed the memorials for sacrificed experimental animals in Tsukuba? They are also well attended to and regularly given offerings. in pre-war Japan and post war developments. It might be interesting for you. I think that it would be interesting for him to come to Tsukuba and see how the spirits ofs animal are appealed or consoled to in local folk customs. Your articles are always full of interesting stuff. A lot of it new even to an oldtimer like myself. but I never attened one. birds. My father in law absolutely belives that having their nest at our house will bring us luck and politely but sternly ignores the neighbours complaint about the birds being unsanitary…..anyway, just wanted to say that I really enjoy your articles.